Sir, You Are Being Hunted has been flushed out of hiding; here’s our Sir, You Are Being Hunted review. Dogs continue to be a popular topic of discussion, ever since their domestication roughly 15,000 years ago, appearing across many forms of media such as books, VHS, compact discs and videogames. But what do we truly know about dogs? Well, if their noses are dry that means they’re a bit poorly. And when they bow down on their front two paws that means they want to play. Beyond that our canine companions are a complete mystery to us, one which I hope to unravel through a study of their behaviours and representation in games. So I’ve turned to two of the most popular indie Kickstarter projects of today, Maia and Sir, You Are Being Hunted, to speak to their creators about their dogs and how they work. First up isSimon Roth’s Maia, the Kickstarter for which ends tomorrow. Maia hasreached its goal of £100,000, as well as the first stretch goal of £101,010, which introduces dogs and cats to the procedurally generated, Dungeon Keeper meets Dwarf Fortress space colony manager. Note that this interview was conducted prior to the stretch goal being met, back when Maia’s dogs existed in a Schrodinger-esque quantum state. PCGamesN: Lets ignore the cats: what planned use will dogs have in your colony? Are they purely defensive or will they interact with colonists? Simon Roth:Dogs will also have a social aspect, following the colonists about and calming them down. There will also be space suits for the dogs to explore the surface with, there’s not much of a game play aspect to this, I just really wanted doggy space suits. PCGN: Will they have personalities and emotions, like their human masters? SR: Indeed! We are just going to hook them up to the same AI system as the humans. This might become a little strange when you get a dog that’s secretly an alcoholic. PCGN: Have you considered what breed of dog it will be? SR: Springer Spaniels, because they are awesome. Also some other working dogs, like Huskies and German Shepherds.There will be a secret tier once the stretch goal is met allowing people to get their own dog in the game. So we might end up with some somewhat unlikely breeds. PCGN: Will they be droid-dogs? Or meat-dogs? SR: Meaty meat-dogs. We had some plans for cybernetic animals, but they got cut when I needed to bring down the scope, and the budget of the game to something realistic. Sir, You Are Being Hunted, on the other hand, will feature 100% metal pooches. The tweed-punk survival horrorgame’s Kickstarterhas already smashed its £40k target, with four days remaining. Big Robot’s Jim Rossignol was on hand to explain how his hunting houndsoperate. 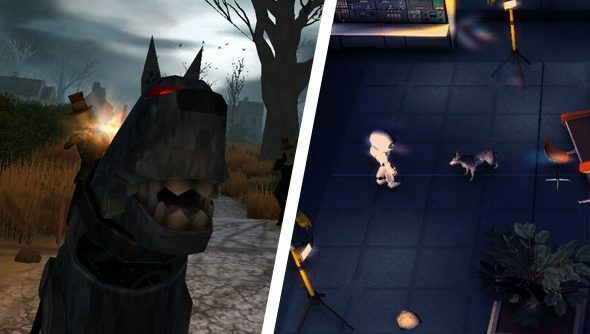 PCGamesN: Can you explain how the robo-hound AI works? Jim Rossignol:Right now the robo-hounds pick a hunter to be their master and thenrun to them. As the hunters then patrol, searching for the player, thehounds have a slightly better sensory acuity, and can detect theplayer further away. If they spot him, they’ll chase him down and pinhim. From there the hunters can close in on the player and finish himoff with a few shotgun blasts. PCGN: Can they operate independently of an owner, or are they simply extensions oftheir robotic master’s malevolence? JR: They are quasi-independent. For example, if a master gets destroyedand the hound survives, it will pick a new master to operate with. PCGN: How often will the player encounter them? JR: Fairly frequently. They will appear with any large group of hunters,and the islands are a small place with a high-speed hound is tailingyou. PCGN: What breed is the robo-hound based on? JR: I think they’re related to the dog in Wallace & Gromit flick, “A CloseShave”. That is a cartoonists nightmare of a guard dog. Is that abreed? PCGN: Did you research how hunting dogs are normally used? Does any of that realworld behaviour factor into Sir? JR: Nope, we just looked at dogs in the street, and then had a cup of tea.The hounds in Sir behave how we basically fear dogs will behave ifthey are ever commanded by posh people. I mean robots. PCGN: What do they sound like? JR: They say “bark bark” in a vocoded human voice. Like most dogs.